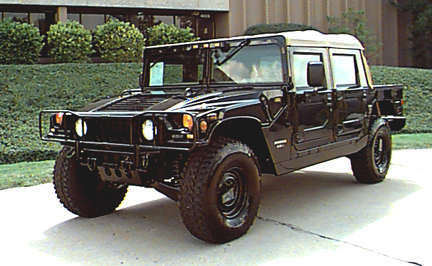 '98 Hummer 4-pass Open Top. Turbo Diesel engine, Deluxe interior, Central tire inflation, Cruise, A/C, Driveline protection, Brushguard, Trailer towing package, Heavy duty wheel w/beadlock, Power mirrors, Power windows, keyless entry, Rocker panel protection, Runflat tire system, Heated windshield. Black. MSRP $77,673 Sale Price Deduct 10% from MSRP.